Thursday evenings, 7-8.30pm. 4, 11, 18, 25 Oct & 1, 8 November 2018. A café in Palmerston North, the exact location yet to be determined, depending on the group. Sande Ramage: trained as an Anglican priest, now Spiritual Care Coordinator at MidCentral DHB, blogs about spirituality one word at a time on www.spritedcrone.co.nz and has recently been in Jungian dream analysis with Fr John Dourley. ‘This book and the analysis changed everything for me. I began to see that my writing about spirituality was a vital part of reimagining my mother tongue, the Christian myth, as a pathway to personal integration. And that I had to encourage what was rising to meet me from the unconscious and not allow the institutional church to shut that life-giving process down’. 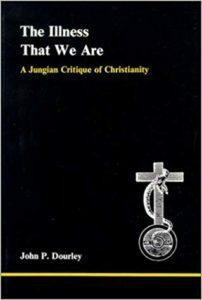 In 1984, Fr John P. Dourley published The Illness That We Are: A Jungian Critique of Christianity, an explosive little book that contends the Christian myth is lopsided having, among other things, eschewed the feminine, ignored the instinctual life and ‘lost access to the depths of the human soul and spirit as expressed in symbol and acted out in rite’. Dourley offers no safe harbour for the institutional church, pointing out that the human spirit can feel ‘justifiably outraged by conceptions of infallibility and claims to exclusive and exhaustive truth attaching to either book or person – all the more so when such claims tend to obscure or even to block the natural religiosity of the psyche and the attendant healing and whole-making powers of the unconscious’. Given that John Dourley was a Roman Catholic priest and Jungian analyst, his work takes on an added mystique and demands attention, particularly when he suggests, in line with Carl Jung, that ‘the genesis of religious experience of the Christian God as well as all the pagan Gods and Goddesses are within the human psyche, even if beyond the ego’s manipulation or control’ and that part of our human task is to develop our own myth in concert with the unconscious. If you’re interested in taking your exploration of the Christian myth beyond what the institutional church seems to offer, exploring within the psychological and religious search for meaning, taking seriously the power of the unconscious in the spiritual journey and prepared to be imaginative about where that might take us then this reading group could be for you. Whilst the book is only 100 pages plus notes, it is not for the faint hearted. But never fear, this group will be friendly, fun and open to a wide variety of ideas as we explore the hinterland together.